North Korean leader says his country and the United States should commit to avoid antagonizing each other. 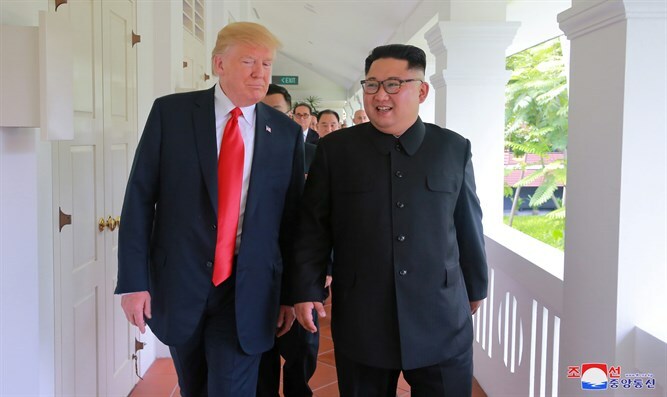 North Korean leader Kim Jong Un said it was "urgent" for North Korea and the United States to halt "irritating and hostile military actions against each other" during talks on Tuesday with U.S. President Donald Trump and other U.S. officials in Singapore, Reuters reported Tuesday night, citing North Korea's official news agency KCNA. Kim reportedly said in Tuesday’s meeting that the North and the United States should commit to avoid antagonizing each other and take legal, institutional steps to guarantee it. The KCNA report added Trump said he "understood" and promised to halt joint U.S.-South Korea military exercises while talks with the North were continuing. Trump, meanwhile, tweeted on Tuesday that his meeting with the North Korean leader was “truly amazing”. “Heading back home from Singapore after a truly amazing visit. Great progress was made on the denuclearization of North Korea. Hostages are back home, will be getting the remains of our great heroes back to their families, no missiles shot, no research happening, sites closing,” he wrote. “Got along great with Kim Jong-un who wants to see wonderful things for his country. As I said earlier today: Anyone can make war, but only the most courageous can make peace!” added Trump.